Find hotel near Musee Schaerbeekois De La .. The association was formed in 1993. One of its members donated 300 bottles of beer. Encouraged, everyone began hunting down all the beer related artefacts they could get their hands on. When the museum finally opened in 1994, it had only two small rooms. The collection continued to grow. Today they have 2000 bottles, glasses, machines, signs and artefacts from extant breweries. 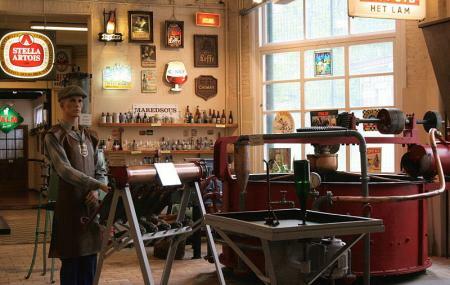 Today, for a low price you can visit the museum and taste some spicy and sweet beer - The Schaerbeekoise. Free for kids under 14. One of the best museum of beer here in Brussels. And definitely you can also drunk beer there. Excellent collection in an authentic place, full of tasty surprises. You must become a member to support this intitiative. Lots of beer bottles, brewing machinery, and all kind of beer-related items which makes an interesting place for beer-lovers. Special beer tasting is also offered! Well, even if I am not interested in drinking beer, I am interested in the museum. Guess that's why I went there.